A work crew from Sage Academy in Brooklyn Park, Minnesota, came to Sisters to help build a home. After four days of the youth filling trenches and sinkholes, helping to install siding and assisting to pour concrete footings, Construction Manager Darleene Snider couldn't have been more appreciative of their hard work. "I was extremely and pleasantly surprised. You guys accomplished a lot. It was an absolutely awesome week," she told the students on their last day. 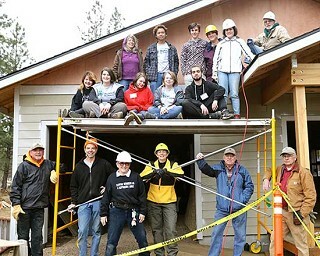 The youth were in Sisters as part of Habitat for Humanity's Collegiate Challenge Program. High school and college students around the nation spend their spring break helping build homes alongside future Habitat homebuyers. Two of the students involved in the service week were exchange students; Giorgio Angelo Runtuwene is from Indonesia and Ricky Clarot from Italy. They had fun helping out and getting asked a lot of questions from Habitat volunteers. Over the course of the four days, the questions went both ways as the students learned about construction. "I've learned that blueprints aren't blue," Junior Haley Morgan said laughing while waiting for the concrete truck to arrive. But in all seriousness, she and fellow classmate Mercedes Magill talked about how much it meant to them to work as a team and get to know the Habitat families and the construction volunteers. "Dennis is great! He's my new grandfather," Magill said about long-time volunteer Dennis Mills, who was teaching the kids how to lay out and assemble a stone patio. Another highlight for Magill was seeing Snider run the job site. "It's great to see a woman in charge," she said of Snider, who has been construction manager for three years. Magill was grateful for the opportunity to learn new skills; skills, she said, that many young women are not given the chance to learn. Social Studies teacher Kelly Crampton said one of the reasons they picked Sisters was because many of the kids had studied the Oregon Trail history in her class. During their time off, the group hiked Peterson Ridge Trail, the Metolius River Trail and visited Sahalie and Koosah Falls. "You can come back anytime," volunteer John Milne told the kids as the volunteers and students said their goodbyes.